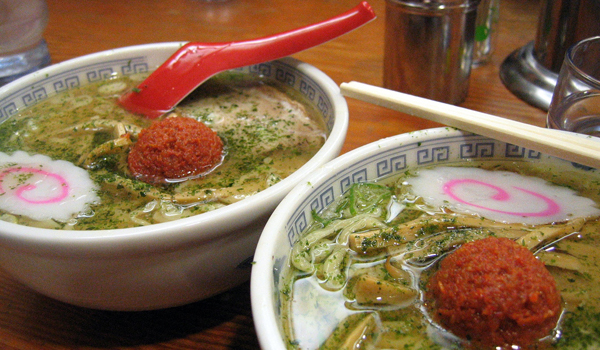 If you’re in Tokyo and you get the munchies, check out Abram Plaut’s top 10 list of ramen shops worth visiting. Kyushu Jangara is a chain shop hailing from the island Kyushu (hence the name). Jangara is one of the most tourist friendly ramen shops in all of Tokyo, located just a one minute walk from Harajuku station. It also has an English menu, making ordering easy for first-timers. On most weekends a member of the staff can be seen just outside the entrance, trying to usher shoppers inside and control customers in waiting if the line gets long. The soup stock here is tonkotsu (pork bone) based, made from slow roasting pork bones for hours, sometimes even days. You can usually pick up a strange smell in the air that is characteristic of the tonkotsu stock making process. The noodles here are quite good, and I would definitely recommend the shop due to its convenience and proximity to the shopping Mecca of Harajuku. 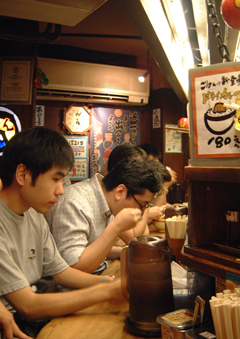 The Shinjuku branch of Menya Musashi is one of most famous ramen shops in the area. It has been featured on Japanese television several times, and lines of 20 people or more stretching down the alleyway are not uncommon around lunchtime on weekdays. Musashi’s ramen is served in a light, shoyu (soy sauce) based broth; hints of katsuo (skipjack tuna) and yuzu (Japanese citrus fruit) can also be noted. After ordering your meal from a vending machine located by the entrance, one of the staff will take your ticket and ask if you want your ramen kotteri (heavier flavor) or assari (lighter flavor). All of the cooks are animated in the open kitchen, with the head noodle chef constantly yelling as he pulls noodles from boiling water and shakes them. Musashi is a good place for ramen beginners; the taste is not too rich or overpowering, and the atmosphere is festive. A good choice if you find yourself near Shinjuku station. Located in Higashi Koenji, Ramen Tetsuya serves up some of the best authentic Sapporo style ramen in Tokyo. I suggest ordering the Shoyu Chashu Men, which comes with hefty slices of smoked pork served over perfectly boiled noodles and a delicious broth. I’ve heard that the original shop is located in Sapporo; this is the owner’s one branch outside of Hokkaido. Overall, one of my favorite bowls of noodles in the city, highly recommended if you are looking for something just a little different than your typical Tokyo ramen. If you have only have time to visit one ramen shop while in Tokyo, Ippudo might be your best bet for a great all-around Japanese ramen experience. Ippudo is one of the most famous ramen chains in Japan. There are many branches spread all across the country serving up Hakata style tonkotsu ramen from the island of Kyushu. The soup stock is creamy and delicious, a unique taste that most people have never experienced prior to arriving in Japan. Along with your ramen comes an assortment of all you can eat toppings, including spicy moyashi (bean sprouts), crushed ninniku (garlic), karashi takana (spicy pickled greens) and shoga (pickled ginger). Ippudo recently gained some publicity in the United States as it opened their first international branch, located in New York City. 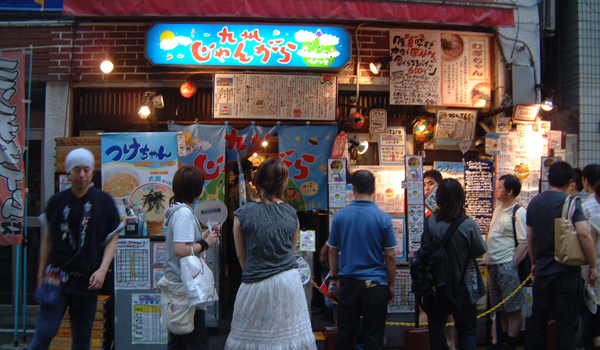 Taishoken is one of the most famous ramen shops in Tokyo. 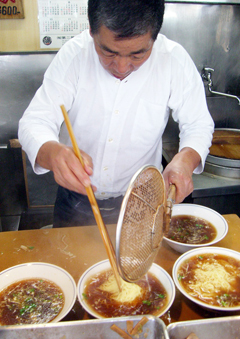 Its owner, Kazuo Yamagishi, is said to be the inventor of tsukemen. While traditional ramen is a soup consisting of noodles, broth, and toppings all served together in a bowl, tsukemen is noodles and soup served separately. The soup that comes with tsukemen is usually a little more potent in flavor than typical ramen broth, and is meant to be used as a dipping sauce for the noodles rather than to drink. 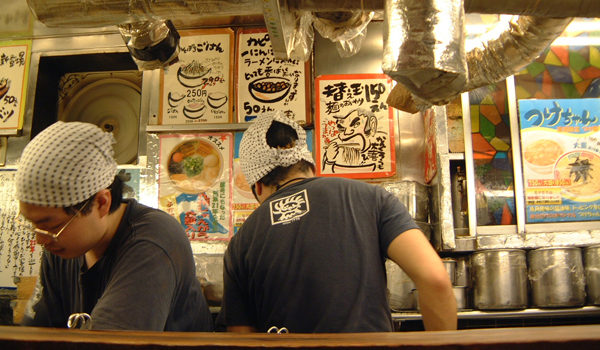 While tsukemen is now common food in Japan, Taishoken is considered to be the original. If any Tokyo ramen shop has a cult following, Ramen Jiro is it. There are 28 locations in the Tokyo metropolitan area (as far as I know), and while each follow the same basic recipe, they all vary slightly depending on the variations of toppings and ingredients the head chef of each shop decides to use. The broth, made from both tonkotsu and shoyu stock, is almost more of a thick sauce rather than soup, with large globules of pork fat suspended the broth. On top of an already massive bowl, the chef will ask if you want additional bean sprouts, garlic, or pork fat, which he will throw in at no extra charge. Jiro is hugely popular with college students, especially male college students. The shops are dirty, the counters greasy, and you are guaranteed to leave with your stomach ready to burst open. Not for the faint of heart but delicious nonetheless, Ramen Jiro is an experience like no other. Ramen Oyaji is a little off the beaten bath, located on the edge of Kanagawa prefecture and over an hour by train from central Tokyo. For those looking for authentic Sapporo style Miso ramen however, look no further, for Oyaji ramen is the next best thing to hopping on a flight up to Hokkaido. The broth here is made from white Miso, and is so creamy and rich I put it right up there with the best ramen I have had in Japan. Not to be outdone by the soup itself, the egg noodles are pretty close to perfection as well, served slightly al dente. I always go with the Oyaji set. At 1000 yen you get a huge bowl of ramen and a plate of delicious gyoza dumplings. Well worth the trip for ramen connoisseurs looking to get out of the city. What looks like a ramen restaurant from the outside is more of a counter where you order, pay, and pick up your bowl of soup. After receiving your bowl of noodles, where and how you eat is left up to you. You can vie for one of the stools or benches on the sidewalk, or at peak hours stand or squat wherever you want and begin slurping away as you hold your bowl with one hand and shovel noodles into your mouth with the other. The menu is simple; you have a choice between a) ramen or b) tamago (egg) ramen. Regular ramen comes with one egg; tamago ramen comes with two. Why the simplicity? Simple, the ramen here is flat out delicious, made from tonkotsu shoyu broth, slightly salty but not overpowering. Hakusan is only open from the hours of 9:00 PM to 5:00 AM, making it a favorite stop after a late night of drinking. While Yasube serves both ramen and tsukemen, one look around the shop interior and you’re likely to see plates full of heaping piles of noodles, hinting that most customers opt for the latter. The kara miso (spicy miso) tsukemen reigns supreme here in my opinion. After all, what could be better than dunking thick, chewy ramen noodles into a zesty chili-miso sauce? The real selling point is the price: for the same amount (790 yen) you can choose your quantity of noodles, from small all the way to extra large. The large size is enormous, making this a must stop for budget travelers looking for quick, delicious, cheap eats. Aoba has gained success by serving simple ramen with the finest ingredients. They are consistently ranked one of the top ramen shops in the city by Japanese noodle enthusiasts, and long lines are not only common, they are to be expected. The soup here is shoyu based but an interesting technique is used putting each order together. Apparently they have two different soup stocks, one made from pork and chicken bones, the other from dried katsuo (skipjack tuna). The two stocks are combined just before the customer is served, creating a unique aroma and flavor. Like many popular ramen shops, Aoba closes every day whenever they run out of soup stock. The busier the day, the sooner they close, sometimes even before dinner time, too early for most people getting off after a long day of work. For more on Japan, including dozens of blogs, local experts and travelers you can link up with, as well as volunteer ops and orgs, please check out the Japan page on Matador.